Back in 1987, the action movie gods aligned the stars to give us Predator, combining great action, iconic dialog, and fantastic creature design into a near-perfect thriller. 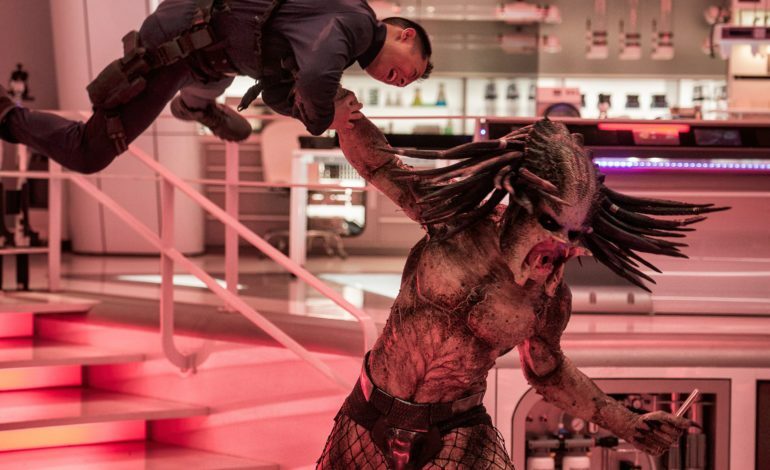 Some thirty years and four middling sequels later, Shane Black looks to revitalize the franchise with his rebooty sequel The Predator. Black’s decidedly campier creature feature is first franchise sequel to take a step out of the original’s shadow, albeit it a sideways step instead of a forward one. Still, one wonders how it took three decades for this franchise to realize that films about sport-hunting aliens aren’t supposed to be so serious. The film opens just like the original – with a predator spacecraft coming to earth. Except this predator isn’t coming to earth to hunt, he’s crash landing right into the lap of Quinn McKenna (Boyd Holbrook), an Army Ranger sniper. McKenna and the predator are quickly snatched up by Traeger (Sterling K. Brown), the head of a shadowy government agency that tracks alien contact, but not before McKenna can mail some alien contraband to his son back in the states. Eager to keep this all as quiet as possible, Traeger has the predator transferred to a government lab and arranges for McKenna to be tossed on a prisoner transport the looney bin. Here we meet what every Predator film requires: a cast of badasses. This go around there’s Trevante Rhodes as Nebraska Williams, Keegan-Michael Key as Coyle, Thomas Jane as Baxley, Alfie Allen as Lynch, and Augusto Aguilera as Nettles. They’re all military, they’re all killers, and here’s the twist: they’re all insane. Throw in Olivia Munn as a geneticist hired to study the predator, a script by Fred Dekker and Shane Black, and you’ve got all the ingredients of a pretty fun film. Now, it’s pretty clear immediately that Black has no real recipe, but they’re solid ingredients nonetheless. The plot of The Predator is as silly as it is convoluted, and it begins to disintegrate into nonsense the moment you exit the theatre, leaving behind gigantic gaps in logic and a timeline that Doctor Who couldn’t make much sense of. You can relax though, none of it actually matters. The film is essentially one long chase, first to recover McKenna’s autistic son Rory (Jacob Tremblay) and the predator’s stolen tech, then to reach the crashed predator ship to find the secret weapon that’s inside. 1987’s Predator found strength in simplicity – the plot of the entire film was to survive and “GET TO THE CHOPPA”. The Predator is needlessly complicated and it’s hard to shake the feeling that this is all happening simply because the plot requires it to. Black never gives these guys a good reason not to throw down their guns and say “Not my predator, not my problem”. But in a film like The Predator, the plot and the characters are just set dressing for what you really bought a ticket for and on that front, the film largely delivers. The Predator is the first film in the franchise that assumes you know what these aliens look like and makes no attempt to hide them in the shadows or obscure them in any way, giving the titular monster more screen time than any film before it. Upping the ante on the original, there are two predators here: the first is your garden variety predator, the second is an upgraded, evolved mega predator. Basically, it’s bigger and badder and more computer generated. As a plus, he comes with dogs. The Predator is, by a pretty fair margin, the bloodiest entry in franchise. When you’re not trying to hide your antagonist (or, if we’re being honest, the protagonist to most fans) you can put every piece of action center screen. The film is built on strong, adrenaline-fueled set pieces strung together with twine and witticisms. The action is bloody and intense, particularly when the smaller predator is involved. Unlike his larger, CGI brother, the old school predator benefits from being an actual man in a suit and excellent makeup. These fights feel visceral and real and are a blast to watch. The mega-predator and his hunting dogs might look more imposing but they don’t pack quite the same punch. Once this predator shows up, the film retreats into the shadows a bit, and it’s a shame they couldn’t do it all practically. Still, if you want to see a predator cut a guy in half, this film has that. Here’s the thing, The Predator isn’t a great movie. It isn’t even really a good movie. It’s silly, nonsensical, and occasionally downright dumb. But it’s also a lot of fun. Shane Black has assembled a great cast, given them some fun lines to say, some big guns to shoot, and some big aliens to fight. There are plenty of reasons to not like The Predator. If you’re a diehard fan of the original, you may not like how it handles the mythology. If you’re a diehard fan of logic or complex characters, you may not like how it doesn’t have those things. But, if you let yourself dig deep and find the twelve-year-old version of yourself, this is totally the kind of movie they would want to sneak into.